Crónicas: The DC Salvi Series is an on-going online digital memory project tracking a reimagination of my Salvadoran family's story and their migration to DC in the 1970s and 1980s. With D.C. having the second largest Salvadoran population in the U.S., this history is often marginalized and forgotten. The civil war broke out in El Salvador in the mid-late 1970s, pushing people to flee their home and make their way up to el norte. Today, DC is home to more than 165,000 Salvadorans. My grandmother came the U.S. before the Salvadoran migration influx in the DC area. She was a pioneer and carved out spaces for herself in order to support her family. She arrived in the area not knowing anyone personally. Most Salvadorans came to the DC area by a friend of a friend, thus the community began building via hearsay. Exhibited at "Salvatrucans Once Again" art show at the GALA Theater in Washington D.C. July 2016. Mi Mama Nena is a tough woman and taught us all what hustle meant. Her story is of resilience, pain and ambition. She brought my mother over as the civil war was starting to make its way to San Salvador, El Salvador's capital. They lived in a small apartment in Columbia Heights on 16th street. This area was first an all African-American neighborhood that quickly transitioned to be a mostly Salvadoran neighborhood. Today,in DC's aggressive gentrification tactics, Columbia Heights has mostly been taken over by corporations. large businesses and white folks. My saliva stopped tasting like sugarcanes from the field a long time ago. 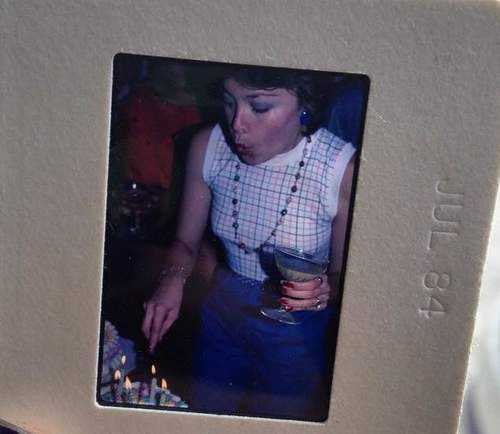 Below is a photo of my mother that has been photoshopped from the original version. My grandmother brought her over when she was just 20 years old. Her stories of crossing and struggle are one to admire. Crossing the border is a very personal story. I'll let the photo tell her story. In Fall 2009, in my first semester of college with the First Wave Spoken Word and Hip Hop Theater Scholarship program, I wrote my first one woman show called "El Viejo Gordo detras del Escritorio". Performed in Spring 2010, this one woman show is based on the a 34-page letter that my grandmother Nena wrote to me about her life. Tackling issues of poverty, violence, immigration and resilience, her story in one piece influence the rest of my artistic career. El Viejo Gordo turned into a Screenprinting series as well. My children. They were calling me. Mattresses blocked windows and doors to stop bullets from flying in. Days, even weeks without clean water and electricity. Go into any household today, go ahead, and you will always see two big tubs of water sitting outside, just in case. Curfews determining hours to kill. Bombs going off in my daughters university, a hair away from blowing her brains out. And my youngest, with her 5 year old nephew she decided to look after, scared to go out side. I call my grandmother Mama, she raised us. It didn't matter if she grew up poor and struggled in the U.S., she always managed to look fly. Whether she bought clothes from la segunda before thrifting became a thing, or if she was making her own clothes as a seamstress, mi mama had an effortless air about her style. She was classic and natural. Blood and chosen family are significant in the immigrant experience. They are who keep you grounded. My mother and aunt always had each other. Although one was living through the war in San Salvador and the other was trying to make it in DC, family was always what kept them going. Black and brown love. My grandmother met Raymond in the 1970s. DC native, boxer and widow, Nena was everything to him. She was his queen. A relationship that lasted over 15 years, my grandmother finally got to know what tenderness looked like. After all of the abuse she had experienced throughout her life, at last, this is what kindness felt like.